Knights of Columbus Council 14360 is proud to announce that its 6th annual St. Patrick’s Day Fundraiser Dinner will be held this year on Saturday evening, March 21 at 5:30 p.m. in the Great Room of St. Matthew Church (216 Scribner Avenue, Norwalk). The St. Patrick’s Day dinner, the council’s oldest tradition, began with a modest 81 attendees in 2010, but has since grown to become an annual tradition at St. Matthew Parish that many parishioners and friends look forward to each year. Last year, an all-time record of 227 guests came for the delicious food and fun. This year’s dinner, like the previous five, will enable Council 14360 to continue its support of a number of local charitable organizations. The success of the 2014 St. Patrick’s Day Dinner generated over $4,000 towards Council 14360’s charitable fund, which covers many groups around Norwalk. Everyone’s generosity enabled the council to subsequently donate funds to worthy organizations such as Al’s Angels, the Notre Dame Convalescent Home, and St. Matthew Church itself. 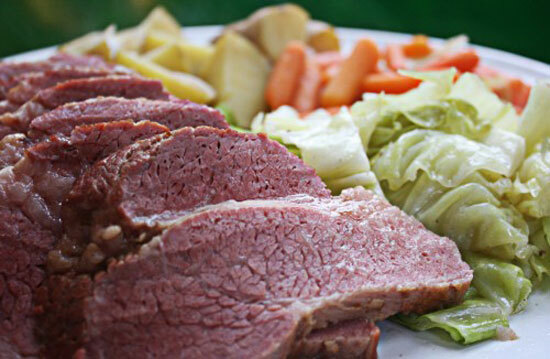 For this year’s dinner, the adult menu will once again include traditional St. Patrick’s Day favorites such as succulent corned beef, cabbage, potatoes, carrots, in addition to sourdough bread, soda and water. A cash bar (beer and wine) will also be offered. Kids will enjoy “Irish” chicken tenders as well as macaroni and cheese, and all attendees will enjoy a delicious dessert. Many exciting raffle prizes will be once again be offered at this year’s dinner. In years past, items such as New York Yankees tickets, Brooklyn Nets basketball tickets, and other sought-after selections have made the raffle very popular, and this year is sure to be no exception. Last year’s Corned Beef Dinner was a lot of fun and also a complete sellout, and space is limited, so be sure to make your reservations soon. Cost is $18 for adults and $7 for children aged 10 and under (there is no charge who children ages three and under).